Lake Minnetonka Association: Are the Milfoil Treatments Experimental? Are the Milfoil Treatments Experimental? As many know, we are preparing for follow up milfoil treatments in Carmans, Grays and Phelps Bays in 2009. Volunteers on each bay are working with their lakeshore neighbors on fundraising to support the costs of the treatments. The Lake Minnetonka Association is gratified that so many of our members support this worthy project for the betterment of Lake Minnetonka. As in 2008, our members’ voluntary contributions will provide the majority of funding for this project. Other funding will come from the Lake Minnetonka Conservation District’s (LMCD) Save-the-Lake fund, the Minnesota Department of Natural Resources (DNR) and some cities. The Lake Minnetonka Association’s vision is these treatments will be expanded to include the entire lake and that Lake Minnetonka can be milfoil-free. We have articulated this vision in our “Milfoil-Free Minnetonka Vision and Plan,” which provides a detailed plan to rid the lake of milfoil and keep new exotic pests out of the lake. As we look forward to implementing and expanding these programs, I want to confront some common misconceptions. This month, I will address whether the milfoil treatments are experimental. They are not. The milfoil treatments are framed in a Lake Vegetation Management Plan (or LVMP), which has been approved by the DNR. For Lake Minnetonka, the LVMP focuses on the three bays (Carmans, Grays and Phelps) and provides for the expansion into other areas of the lake. A technical committee composed of experts from the DNR, University of Minnesota, US Army Corps of Engineers, Three Rivers Park District and the Lake Minnetonka Association, with additional input from LMCD and Hennepin County, evaluated management methods that would control Eurasian watermilfoil and protect native plants. The committee concluded the use of selective herbicides was the only feasible and safe method. Here, ‘selective’ refers to selectively killing milfoil and not other plants. The LVMP is a five-year plan for treatments in the three bays, including ongoing evaluation of the results for the purpose of making adjustments from year-to-year. After five years, we expect annual small-scale maintenance treatments will be needed to keep on top of milfoil. The LVMP is neither designed for nor intended to be experimental. ‘Experimental’ refers to a scientific method used to test hypotheses and requires a highly controlled environment – obviously not the case for the milfoil control program. The MN DNR and others, including the Lake Minnetonka Association, hope to learn and demonstrate that in addition to controlling milfoil, these treatments will allow the protection and recovery of native plants in the lake. Treatments such as occurred in 2008 and are planned in 2009 are common across the United States. The particular herbicides have been widely-used and their results are well-understood. 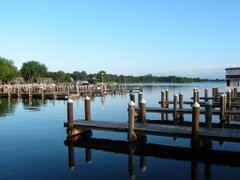 Because Lake Minnetonka has unique features and we are not yet able to treat the entire lake, we are ‘tweaking’ the protocol by manipulating the timing, dose and combination of the herbicides to get the most effective result as detailed in the LVMP. We are confident this approach used in 2008 and planned in 2009 with minor modification will accomplish our shared objective of ridding these bays and ultimately the entire lake of milfoil and restoring a healthy native plant assemblage. Milfoil has been the top concern and complaint we have heard over the past decade. This tells us we are on the right track. What are you using to treat the Milfoil problem? 2,4-D?